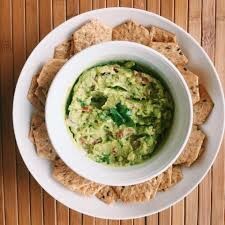 Snacks should taste good, be healthy & keep you full between meals. Here are 5 snacks that will do just that! Eating 1 to 3 snacks daily provides the body fuel it needs to stay energized throughout the day. When coupled with 3 well-balanced meals, snacks help you maintain a healthy diet. Snacks can also sabotage a healthy diet. If the snacks do not contain a healthy fat, complex carbohydrate (in the form of fruits, vegetables or whole grains) and good protein, they can leave you hungry before it’s time for your next meal. This makes you prone to overeating by eating extra snacks or too much at your next meal. THESE snacks will keep you full until your next meal. Please don’t be afraid of the healthy fat! 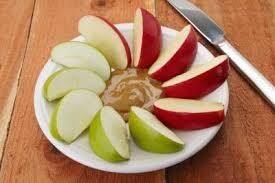 Just slice a medium size apple removing the core and eat with 2 tablespoons of your favorite peanut butter. Other nut butters will do the trick too. If you have a nut allergy just substitute your favorite cheese! A serving of cheese is the length & width of one finger. 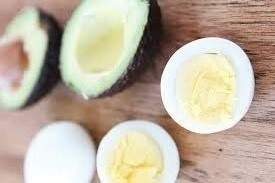 Pair this high protein snack with a little salt and pepper and a few slices of avocado. Yum! Cook several eggs ahead of time for a quick grab-n-go snack. Remember 1 avocado = 5 servings so a few slices is all you need. Mix the rest of the avocado, a couple spoonfuls of fresh salsa, a squeeze of lime, salt, pepper & cilantro to make a batch of guacamole. This wonderful fruit (yes, avocados are a fruit) is packed with “good” fat that not only tastes good as guacamole but tastes great when served with whole grain crackers or some veggie slices. 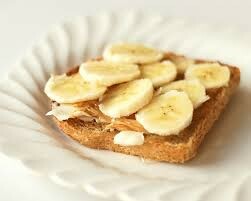 Toast a slice of your favorite whole grain bread, spread 1-2 tablespoons of your favorite nut butter then carefully position banana slices on top. This sweet treat tastes even better if you butter the bread before adding the nut butter. This is one of my personal favorites!!! 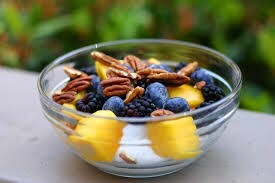 A serving of plain yogurt, your favorite nut(s) and fruit make a great snack when combined. A single serving yogurt and a fruit cup make this a good grab-n-go snack along with a snack bag of nuts you’ve already prepared. The juice from the fruit cup will sweeten the yogurt. Use a full fat yogurt for best results! Good snacks fuel the body and help maintain balanced blood sugar levels. Eating your snack while sitting in a peaceful setting and taking time to enjoy each bite only helps to enhance their effectiveness. Be mindful of serving sizes and enjoy! Michelle Carrington is an Integrative Nutritionist who believes that healing starts with assessing what you eat, how you eat, where you eat and how you care for yourself. She has worked in clinical and group settings treating clients and educating the community on the importance of good nutrition and a balanced lifestyle as part preventing or treating numerous health issues. Michelle has witnessed first hand how good nutrition and a balanced lifestyle can foster healing along with medical intervention (when needed) in the care of her clients who have suffered from food allergies, memory and mood disorders, hypertension, high cholesterol and diabetes. She is passionate about sharing what she’s learned to help others. Michelle is now accepting new clients. She can be contacted at [email protected] or 240-393-1943.